This is an overview of the settings, integrations and backup options the application offers. The three tabs are presented below. In order to edit your Application Settings, go to Settings -> Application settings. >it is advised that you setup the following preferences before you start using Elorus officially, for your convenience. Various features related to invoicing, notifications/email and display parameters are setup from this tab. Set how Elorus calculates values in your Estimates, Invoices, Bills & Recurring documents. This is a default value that you can override for each document. For more details, visit the related article here. Set up the total number of numerals in the document's number (e.g. "005" or "00005"). If enabled, Elorus will always allocate a number when creating a new document. Disable this setting if you want your new documents to receive a number only after they're issued. If enabled, invoices & credit notes will only be issued if they follow a valid sequential numbering. See detailed instructions here. By clicking Check numbering, Elorus checks the numbering of the organization's sales records and looks for mistakes. If there are any errors, it will display them in a list along with correction suggestions. If this happens often, we recommend that you select the "Force sequential numbering" function (after you fix the errors). A new draft invoice will be automatically created every time an estimate gets accepted. For more information on accepting/rejecting estimates, see here. The format in which your company's and your contacts' addresses will be displayed on your documents. Predefined placeholders, space characters and ',', '. ', '-', '|' are allowed. The rate of your billable hour. This is a default value, you may override your rate on a per-project basis. For more information on projects, visit the instructions here. If your client responds to an email sent through Elorus, the reply to email that you set up here will receive the reply email. Note that if you don't set an email address in this field, the application will forward client replies to the email of the user who initially sent the email. This will establish the CC email address to which every invoice you send to each client will be forwarded. You can chose how you want your contacts to appear in the contacts page and in all contact / client / supplier selection boxes across the application. 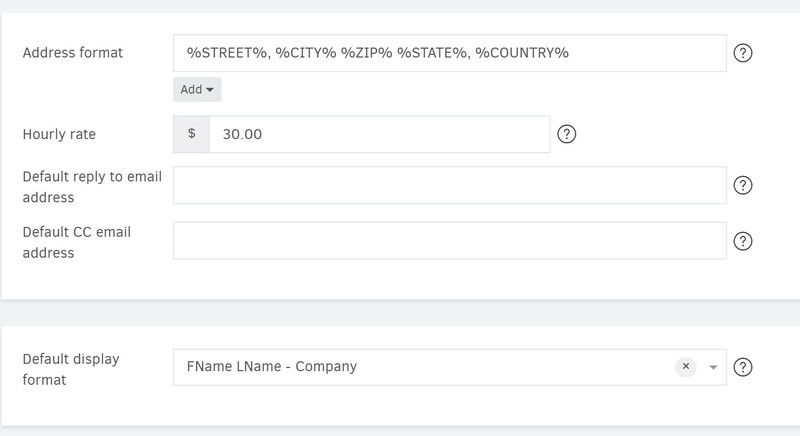 Determine how your company details will be displayed on the client portal. If you disable this option, Elorus will prevent you from invoicing products that are out of stock. The setting applies only to products / services whose stock is being managed. For further instructions on stock management, visit the related article. The Integrations tab allows you to connect Elorus with supported third-party applications. Install the Elorus4Slack application to receive Elorus notifications on Slack. For instructions, visit the related article. Enable this integration to import contacts based on their european VAT number via the contacts page. To proceed, hit "Install". To see more regarding back ups, see here.